Endodontic management of non-vital young permanent tooth with a wide-open blunder-buss apex has long presented a challenge. In the past, techniques for management of the open apex in non-vital teeth were confined to custom fitting the filling material, paste fills and apical surgery. However, the limited success enjoyed by these procedures resulted in significant interest in the phenomenon of continued apical development, or establishment of an apical barrier referred to as "Apexification". Several procedures utilizing different materials have been recommended to induce root end barrier formation. Apexification with calcium hydroxide [Ca(OH)2 ] is the most commonly advocated therapy for immature teeth with non-vital pulp. Whilst the advantages of calcium hydroxide lie in the fact that it has been widely studied and has shown success, ,, the disadvantages are its prolonged treatment time, the need for multiple visits and radiographs. In some cases, root resorption possibly caused by trauma, and increased risk of root fracture due to dressing the root canal for an extended time with calcium hydroxide has been reported in teeth undergoing apexification. 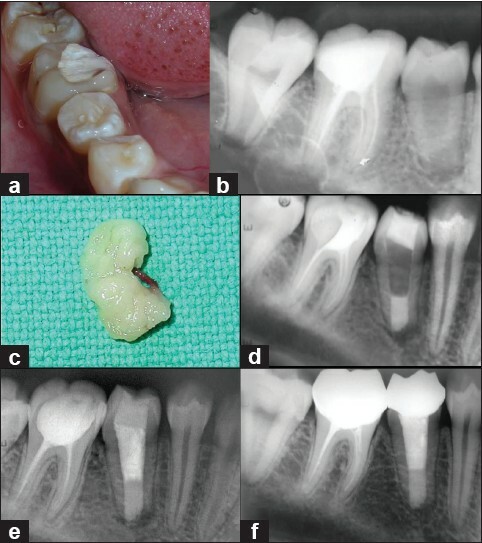 One alternative to calcium hydroxide apexification is a single-step technique using an artificial apical barrier. The one-step apexification has been described as the non-surgical compaction of a biocompatible material into the apical end of the root canal, thus, creating an artificial apical stop and enabling immediate filling of the root canal. Advantages of this technique include shorter treatment time, and development of a good apical seal. A number of materials have been proposed for this purpose including tricalcium phosphate,  calcium hydroxide,  freeze dried bone,  freeze-dried dentin,  collagen calcium phosphate,  proplast (a polytetrafluor-ethylene and carbon felt-like porous material). Antibacterial pastes like metronidazole, ciprofloxacin, and cefactor have effectively encouraged apexification. Deliberate over-instrumentation of the periapical area to produce a blood clot that will induce apical closure has also been described. Over the last decade, mineral trioxide aggregate (MTA) has been researched extensively and reported as a possible answer to many clinical endodontic challenges. Various studies involving MTA in apexification procedures have shown promising results. One of the technical problems associated with the placement of the restorative material used as artificial barrier is to prevent an overfill and underfill. Lemon (1992) introduced the "internal matrix concept" for treatment of root perforations. He recommended the use of amalgam for sealing the perforation, which would be condensed against an external matrix of hydroxyapatite, carefully pushed through the perforation thus serving as an external barrier and matrix. The modified internal matrix concept introduced by Bargohlz uses in contrast to other treatment concepts, collagen as a completely resorbable barrier material and MTA for sealing of the perforation. Repair of perforations requires a matrix to control the repair material. The same concept holds true for placement of the apical barrier in immature tooth. Platelet Rich Fibrin (PRF) was first described by Choukran et al. in France. PRF belongs to a new generation of platelet concentrates, which has been shown to have several advantages like ease of preparation, lack of biochemical handling of blood which makes this preparation strictly autologus, promotion of wound healing, bone growth, bone maturation, and hemostasis. PRF can be obtained in the form of a membrane by squeezing out the fluids in the fibrin clot. This case report presents the management of an immature tooth (with an open apex) with a single step apical barrier placement using MTA and autologus PRF membrane as an internal matrix. A 20 year-old female patient presented to the department of Conservative dentistry and Endodontics, with pain in the right mandibular posterior region. Patient had experienced continuous dull pain for 3 weeks. Previous dental history included endodontic root canal therapy of #46. No history of swelling was given by the patient. On clinical examination, the right mandibular 2 nd premolar was rotated from buccolingual to mesiodistal direction, with the buccal and lingual cusps placed distally and mesially respectively. The tooth showed no signs of caries or fracture [Figure 1]a. Examination of the head and neck region revealed no palpable lymph nodes. Medical history was non-contributory. All vital signs were found to be within normal limits. Oral examination revealed no soft tissue or bony abnormalities. The tooth was not sensitive to palpation or percussion, and was not mobile as well. Radiographic examination (Intraoral periapical radiograph) revealed an incompletely formed apex of mandibular right 2 nd premolar that tested non-vital in response to thermal and electric pulp vitality testing, and with a diffuse radiolucency of about 0.5 x 0.5 cm around the apex [Figure 1]b. Occlusal trauma was considered as the possible etiology for the resulting periapical lesion of the tooth #45. Obturation with tooth #46 was not acceptable upon radiographic appearance (obturation was short and IOPA showed some amount of periapical rarefaction). Retreatment with tooth #46 was advised; however, the patient did not give consent for the same. Local anaesthesia was administered and a rubber dam was applied. Endodontic access cavity was done on the occlusal surface using a No. 2 round bur and EX 24 bur (non end cutting tapered fissure; Mani, Tochigi, Japan). The canal was instrumented lightly with K files (Mani, Japan) with the aim of cleaning the root canal walls of debris. The canal was thoroughly debrided with a copious irrigation of sodium hypochlorite (1%) and saline (0.9%), coupled with ultrasonic agitation (Irrisafe, Satellec, France) to ensure complete removal of the necrotic pulp tissue. The canal was dried with sterile paper points, and Calcium hydroxide (Ultracal XS, Ultradent, South Jordan, and UT) was placed as an intracanal medicament and the access cavity was temporized with Cavit G (3M ESPE; Germany). The patient was recalled after 1 week. After 1 week, the tooth was asymptomatic. At this appointment, it was decided to use PRF membrane as an internal matrix against which MTA would be placed as an apical barrier. Informed consent of the patient was obtained in writing after thoroughly explaining the clinical procedures, risks involved and clarifying all questions raised by the patient. The root canal was flushed with 1% sodium hypochlorite followed by normal saline. The canal was dried with absorbent paper points (DENTSPLY, Tulsa Dental). PRF membrane preparation was performed by using the procedure described by Dohan D M et al. 30 minutes before the clinical procedure. 8.5 ml of whole blood was drawn by venipuncture of the antecubital vein. Blood was collected in a 10 ml sterile glass tube without anticoagulant and immediately centrifuged at 3000 revolutions per minute (rpm) for 10 minutes. The resultant product consisted of three layers: topmost layer consisting of acellular platelet poor plasma, PRF clot in the middle and Red Blood Cell's at the bottom. The PRF clot was retrieved and fluids were squeezed out to obtain a PRF membrane [Figure 1]d. PRF membrane was gently compacted using hand pluggers to produce a barrier at the level of the apex with the use of operating microscope (Carl Zeiss). MTA was introduced into the canal and compacted using schilders pluggers (DENTSPLY Caulk, Milford, DE) against the PRF membrane. A radiograph was exposed to confirm adequate placement of MTA to form an apical stop approximately 3-4 mm thick [Figure 1]c. The blunt end of a large paper point was moistened with water and left in the canal to promote setting. A cotton pellet was placed in the chamber and the access cavity was sealed with temporary filling material Intermediate Restorative Material (IRM) (Caulk/DENTSPLY, Milford, DE). After 1 week, the patient remained asymptomatic and the tooth was isolated and accessed as before. A hand plugger was lightly tapped against the MTA plug to confirm a hardened set. The canal was obturated using AH Plus sealer (Dentsply DeTrey, Konztanz, Germany) and injectable thermoplasticized gutta percha (E and Q plus Meta Biomed Co ltd-Korea). The tooth was restored with resin composite. Teeth # 45 and 46 were both rehabilitated with crowns after 2 months post-operatively. The patient was recalled 2 months postoperatively, and after 1 year. Follow-up radiographs at 2 month interval showed reduction in sizeof radiolucency and at 1 year interval showed further healing with calcifc barrier at the apex. [Figure 1]e and f.
Calcium hydroxide has been the first choice material for apexification, with repeated changes over the course of 5-20 months to induce the formation of a calcific barrier. The unpredictable and often lengthy course of this treatment modality presents challenges, including the vulnerability of the temporary coronal restoration to re-infection. Moreover, the treatment requires a high level of patient compliance. For these reasons, one visit apexification has been suggested. MTA introduced by Torabinejad and colleagues at Loma Linda University has shown promising results. MTA has demonstrated minimal leakage of dye and bacteria in comparison with other restorative materials. MTA, a bio-compatible material, can be used to create a physical barrier that also helps in formation of bone and periodontium around its interface. With the use of MTA, the potential for fractures of immature teeth with thin roots is reduced, because a bonded core can be placed immediately within the root canal. Platelets are known to contain a variety of growth factors, including transforming growth factor b, vascular endothelial growth factor, and platelet-derived growth factor. These growth factors are released from the platelets when they are activated, secreted, or aggregated by collagen or epinephrine. PRF is an immune platelet concentrate, collecting on a single fibrin membrane all the constituents of a blood sample favourable to healing and immunity. PRF has been considered as a fibrin biomaterial. Its molecular structure with low thrombin concentration is an optimal matrix for migration of endothelial cells and fibroblasts. It permits a rapid angiogenesis and an easier remodelling of fibrin. It features all the necessary parameters permitting optimal healing. These consist of a fibrin matrix polymerized in a tetra molecular structure, the incorporation of platelets, leukocyte and cytokines, and the presence of circulating stem cells. PRF stimulates osteoblasts, gingival fibroblasts, and periodontal ligament cells proliferation as a mitogen. Many growth factors such as platelet derived growth factors and transforming growth factors, are released from PRF. The properties of this natural fibrin biomaterial thus offer great potential during wound healing. Moreover, PRF is totally autologus and will definitely be more biocompatible than any other material. The combination of PRF as a matrix and MTA as an apical barrier could be considered as a good option for creating artificial root-end barriers. However, controlled clinical trials are necessary to investigate the predictability of the outcome of the technique. 1. Rafter M. Apexification: A Review. Dent Traumatol 2005;21:1-8. 2. Frank AL. Therapy for the divergent pulpless tooth by continued apical formation. J Am Dent Assoc 1966;72:87-93. 3. Ghose LJ, Baghdady VS, Hikmat BY. Apexification of immature apices of pulpless permanent anterior teeth with calcium hydroxide. J Endod 1987;13:285-90. 4. Kerekes K, Heide S, Jacobsen I. Follow-up examination of endodontic treatment in traumatized juvenile incisors. J Endod 1980;6:744-8. 5. Cvek M. Prognosis of luxated non-vital maxillary incisors treated with calcium hydroxide and filled with gutta percha. A retrospective clinical study. Endod Dent Traumatol 1992;8:45-55. 6. Saunders WP, Saunders EM. Coronal leakage as a cause of failure in root canal therapy: A review. Endod Dent Traumatol 1994;10:105-8. 7. Andreason JO, Farik B, Munksgaard EC. Long-term calcium hydroxide as a root canal dressing may increase risk of root fracture. Dent Traumatol 2002;18:134-7. 8. Morse DR, O'LarnicvJ, Yesilsoy C. Apexification: Review of literature. Quintessence Int 1990;21:589-98. 9. Coveillo J, Brilliant JD. A preliminary clinical study on the use of calcium phosphate as an apical barrier. J Endod 1979;5:6-13. 10. Schumacher JW, Rutledge RE. An alternative to apexification. J Endod 1993;19:529-31. 11. Rossmeisl R, Reader A, Melfi R, Marquard J. A study of freeze-dried (lyophilized) cortical bone used as an apical barrier in adult monkey teeth. J Endod 1982;8:219-26. 12. Rossmeisl R, Reader A, Melfi R, Marquard J. A study of freeze-dried dentin used as an apical barrier in adult monkey teeth. Oral Surg 1982;53:303-10. 13. Nevins A, Finkelstein F, Laporta R, Borden BG. Induction of hard tissue into pulpless open-apex teeth using collagen-calcium phosphate gel. J Endod 1978;4:76-81. 14. Eleazer PD, McDonald TW, Sinai IH, Fantasia JE, Michelich RJ, Yagiela JA. Proplast as an apical barrier in root canal therapy. J Endod 1984;10:487-90. 15. Thibodeau B, Trope M. Pulp revasculaization of a necrotic infected immature permanent tooth: Case report and review of the literature. Paediatr Dent 2007;29:47-50. 16. Ham JW, Patterson SS, Michell DF. Induced apical closure of immature pulpless teeth in monkeys. Oral Surg Oral Med Oral Pathol Oral Radiol Endod 1972;33:438-49. 17. Lemon RR. Nonsurgical repair of perforation defects. Internal Matrix Concept. Dent Clin North Am 1992;36:439-57. 18. Bargholz C. Perforation repair with mineral trioxide aggregate: A modified matrix concept. Int Endod J 2005;38:59-69. 19. Dohan DM, Choukroun J, Diss A, Dohan SL, Dohan AJ, Mouhyi J, et al. Platelet-rich Fibrin (PRF): A second-generation platelet concentrate. Part I: Technological concepts and evolution. Oral Surg Oral Med Oral Pathol Oral Radiol Endod 2006;101:E37-44. 20. Sheehy EC, Roberts GJ. Use of calcium hydroxide for apical barrier formation and healing in nonvital immature permanent teeth: A review. Br Dent J 1997;183:241-6. 21. Magura ME, Kafrawy AH, Brown CE Jr, Newton C. Human saliva coronal microleakage in obturated root canals: An in vitro study. J Endod 1991;17:324-31. 22. Morse DR, O' Larnic J, Yesilsoy C. Apexification: Review of the literature. Quintessence Int 1990;21:589-98. 23. Torabinejad M, Watson TF, Pitt Ford TR. Sealing ability of mineral trioxide aggregate when used as a root end filling material. J Endod 1993;19:591-5. 24. Pitt Ford TR, Torabinejad M, McKendry J, Hong CU, Kariyawasam SP. Use of mineral trioxide aggregate for repair of furcal perforations. Oral Surg Oral Med Oral Pathol 1995;79:756-62. 25. Torabinejad M, Pitt Ford TR, McKendry DJ, Abedi HR, Miller DA, Kariyawasam SP. Histologic assessment of mineral trioxide aggregate as a root-end filling in monkeys. J Endod. 1997;23:225-228. 26. Benenati F, Roane J, Bigss JT, Simon J. Recall evaluation of iatrogenic root perforations repaired with amalgam and gutta percha. J Endod 1986;12:161-6. 27. Shabahang S, Torabinejad M, Boyne PP, Abedi H, McMillan P. A comparative study of root end induction using osteogenic protein- 1, calcium hydroxide, and mineral trioxide aggregate in dogs. J Endod 1999;25:1-5. 28. Pradhan DP, Chawla HS, Gauba K, Goyal A. Comparative evaluation of endodontic management of teeth with unformed apices with mineral trioxide aggregate and calcium hydroxide. J Dent Child 2006;73:79-85. 29. Mesimeris V, Sade E, Baer PN. Calcium sulfate as a biodegradable barrier membrane: A preliminary report on the surgiplast technique. Peiodontal Clin Invest 1995;17:13-6. 30. Alhadainy HA, Himel VT, Lee WB, El Baghdady YM. Use of a hydroxyapatite-based material and cacium sulfate as artificial floor to repair furcal perforations. Oral Surg Oral Med Oral Pathol Oral Radiol Endod 1998;86:723-9. 31. De-Deus G, Coutinho-Filho T. The use of white Portland cement as an apical plug in a tooth with a necrotic pulp and wide-open apex: A case report. Int Endod J 2007;40:653-60. 32. Choukroun J, Diss A, Simonpieri A, Girard MO, Schoeffler C, Dohan SL, et al. Platelet-rich fibrin (PRF): A second-generation platelet concentrate, part IV: Clinical effects on tissue healing. Oral Surg Oral Med Oral Pathol Oral Radiol Endod 2006;101:E56-60. 33. Tsai CH, Shen SY, Zhao JH, Chang YC. Platelet-rich fibrin modulates cell proliferation of human periodontally related cells in vitro. J Dent Sci 2009;4:130-5.